You are cordially invited to #BudgetSpeak, our urban budget consultation. 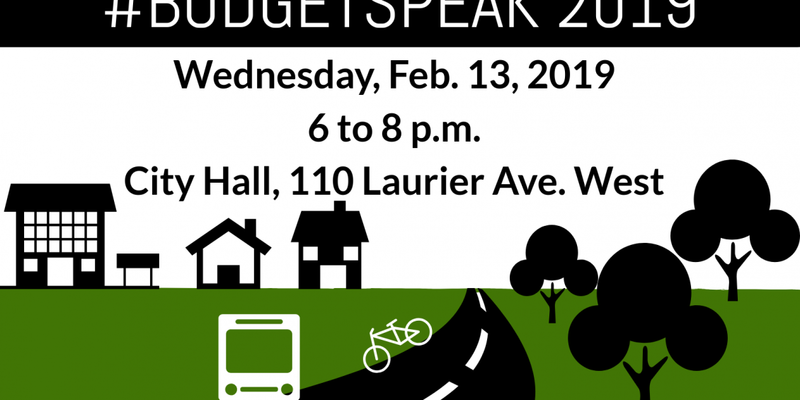 Budget Speak is an interactive opportunity to provide input on the City’s 2019 budget. It is taking place on Wednesday, February 13, 2019 from 6 to 8 p.m at City Hall 110 Laurier Avenue West. BudgetSpeak is hosted by Team Fleury as well as Councillors Leiper, McKenney, Menard and Rideau-Rockcliffe Ward. We hope you can join us at this event and have your say about the 2019 budget. As a reminder, during winter parking bans, residents are allowed to park their cars in the Jules Morin parking lot between 10 pm and 7 am, in the Strathcona parking lot between 10 pm and 7 am or at the University of Ottawa parking garage (33 Mann Ave) between 10 pm and 6:30 am. Please ensure you remove your car before the morning deadlines to avoid tickets. Even if you have an on-street parking permit we encourage you to take advantage of these free parking locations. Overnight snow plowing operations are much simpler when cars are off the streets. You will notice an improvement in the snow clearing efforts on your street.